Last year the Vermont Arts Council ran a statewide arts campaign, called Palettes of Vermont, that engaged 118 organizations and 40,000 palette-painting participants in 247 of the states 251 towns. (Arent the other four gores or something?) Most of those towns hosted painting-party workshops and exhibits of their palettes, and collectively raised some $300,000. On the heels of that happy success, this years project, dubbed Art Fits Vermont, is a puzzle. Since we accomplished all our goals last year, we took the time to think about whether we wanted a theme, says Diane Scolaro, communications and development director at the VAC. The thing that was the most outstanding result was the connections between people  artists connecting with communities, communities with other communities, etc. Bingo: Nothing says connection more than puzzle pieces, right? 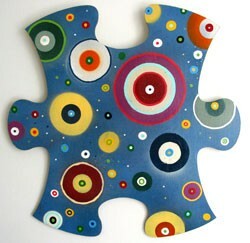 Beginning in April, participants will be given an outsized puzzle piece to decorate as they see fit. Its approximately 14 by 14 inches, with two innies and two outies, as Scolaro puts it, so its universally connectable. The Vermont Wood Manufacturers will provide about 8000 wood puzzle pieces, she explains. Another 50,000 paper versions will be made available to kids in school or summer camp programs. So right there were looking at almost 60,000 pieces, Scolaro adds. The VAC is partnering with the states tourism department to make sure visitors find out about puzzle events, too. And thats not all. This year, the neighbors are invited. Because of the Lake Champlain celebration, Scolaro says, We will give puzzle pieces to artists in Québec and New York, as well as France. France? Mais oui  the birthplace of explorer and lake namesake Samuel de Champlain, nest-ce pas? Either way, Art Fits Vermont will launch on April 16. To find out the meeting schedule or otherwise get involved in this project thats bigger than the sum of its parts, visit www.vermontartscouncil.org.